CARBONDALE, Ill. — For most people, money issues start to build up around the college years. Student loans, credit card debt and mounting expenses can quickly become a 20-30-year repayment project. But with a little thought and careful planning, author and speaker Adam Carroll believes students can live strategically while still in college, and set themselves up for long-term financial freedom. Carroll, internationally recognized financial literacy expert with the National Financial Educators, is coming to Southern Illinois University Carbondale to present “Winning the Money Game.” The lecture addresses important topics such as strategic budgeting, helpful scholarships, planned savings and appropriate lifestyle habits. As author of “The Money Savvy Student,” creator of the documentary film, “Broke, Busted and Disgusted,” and two-time TED Talks speaker with over 2 million views, Carroll knows a bit about financial literacy. He is motivated by the goal of helping people build bigger lives, not bigger lifestyles and believes the process starts early on. Participants can expect to be both challenged and inspired to think outside of the box and build toward their futures. Reporters, photographers and news crews are welcome to cover the presentation. Interview opportunities may also be available with Adam Carroll, financial literacy expert and creator of the documentary “Broke, Busted and Disgusted.” To arrange for an interview, contact Kara Weshinskey at 618/453-4611 or kara.weshinskey@siu.edu. 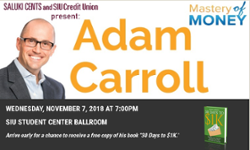 Saluki Cents, an on campus financial literacy program, and SIU Credit Union are the hosts for Carroll’s upcoming lecture. Students who are interested in learning more about financial issues are encouraged to attend the other workshops and information sessions. For more information, contact Saluki Cents at 618/453-4611 or salukicents@siu.edu.